Here are the top reasons why your Instant Pot is not sealing. This guide helps you troubleshoot the main problem most Instant Pot users encounter: that the Instant Pot is not being pressurized. Update August 2018: This article has been updated with additional reasons your Instant Pot is not sealing, based on reader comments and feedback. Add any tomato product and/or starchy ingredients (rice, pasta, etc) at the end and DON’T stir. Just push down with a large spoon or spatula to submerge in liquid. Increase the quantity of liquid called for in the recipe. One of the most common problems Instant Pot users encounter is that their Instant Pot won’t pressurize (or seal). This happens to me and I’m pretty sure it happens to most Instant Pot and pressure cooker users. New Instant Pot users especially have a hard time troubleshooting what’s wrong when their Instant Pot is not sealing. 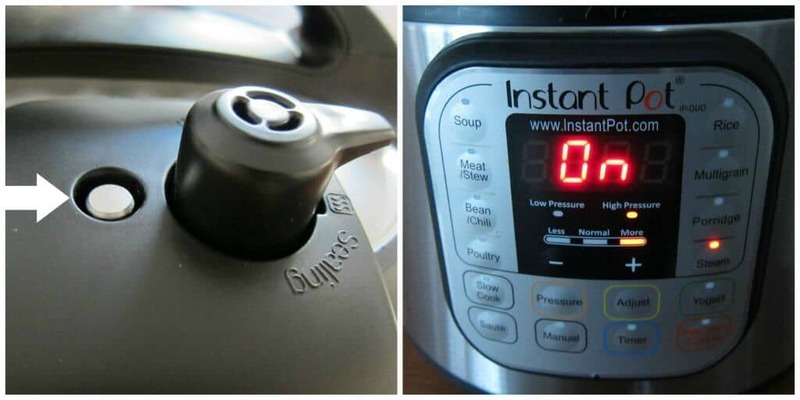 When you first turn on the Instant Pot, the display reads ‘On’ and after a few minutes (anywhere from 5 minutes to 30 minutes, depending on the quantity and temperature of the food) you’ll see and hear steam coming out of the pressure release (steam release) handle and/or float valve. After some hissing and steaming and hesitation, the float valve usually rises all the way up and the Instant Pot is sealed. If you’ve waited for longer than usual and the float valve isn’t popping up, there’s a possibility that your Instant Pot is not going to pressurize. And if the timer begins and the float valve is still down, it’s definitely not going to seal. I’ve put together a list of possible reasons why your Instant Pot is not sealing and won’t pressurize. If your Instant Pot is showing the ‘noPr’ error message, it could be that your Instant Pot couldn’t reach a high enough temperature during the pre-heating stage. This could be due to the quantity of food or liquid, or the presence of frozen ingredients. If not making any of the following mistakes, press ‘Cancel’ and try restarting the pressure cooking program again. Note: Once you diagnose the reason your Instant Pot isn’t coming to pressure and before you continue with your pressure cooking, make sure you have enough liquid in the Instant Pot. Often times, the liquid has evaporated over a period of time, because either the sealing ring wasn’t in place or the pressure release handle was in the venting position. 1. Pressure release (steam release) handle is in the venting position. The pressure release handle needs to be in the sealing position when cooking on any mode other than slow cook or yogurt. Solution: Open the Instant Pot and make sure there’s enough liquid. If too much liquid has evaporated, the Instant Pot won’t pressurize. 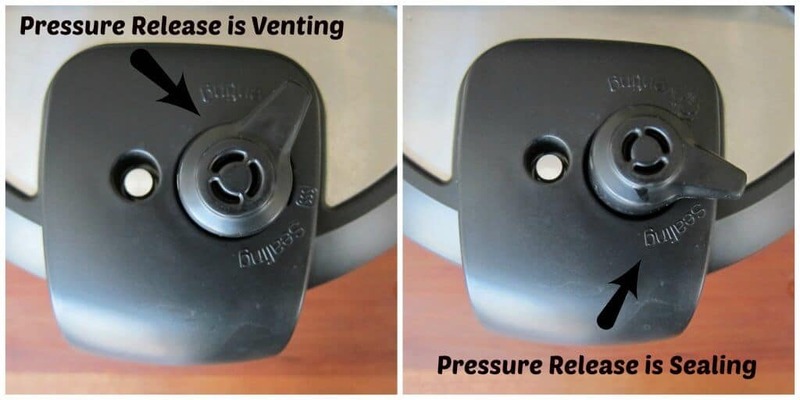 Close the Instant Pot with the steam release handle in the VENTING position. Since the contents are warm, this will allow you to close the pot properly. Once it’s closed, move the steam release handle to the SEALING position. 2. Sealing ring (also referred to as the gasket) is not properly seated. If your ring cannot be rotated around the sealing ring rack, it’s not properly seated. You should be able to turn it in place, with a bit of effort. If your sealing ring hasn’t been installed correctly, you may find that steam is leaking out of the sides of the lid. Solution: Open the Instant Pot and push down the sealing ring all around the ring rack to make sure it’s properly seated. Try and turn it in the ring rack. It should move/rotate around the ring rack. 3. Sealing ring is missing/misplaced. 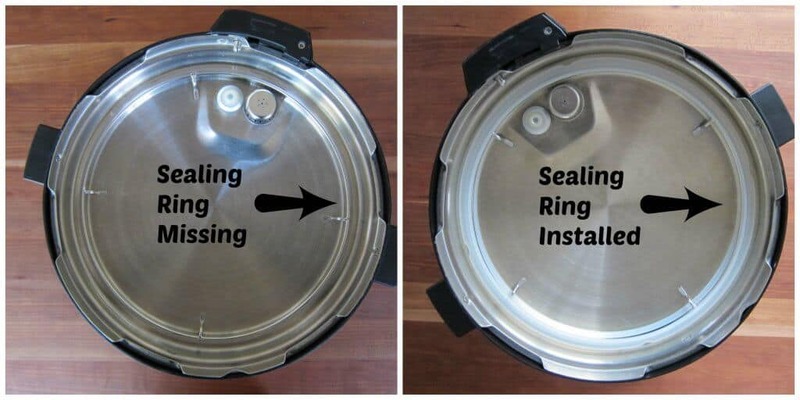 Often times, the sealing ring has been removed for cleaning and isn’t placed back in the Instant Pot lid’s ring rack. 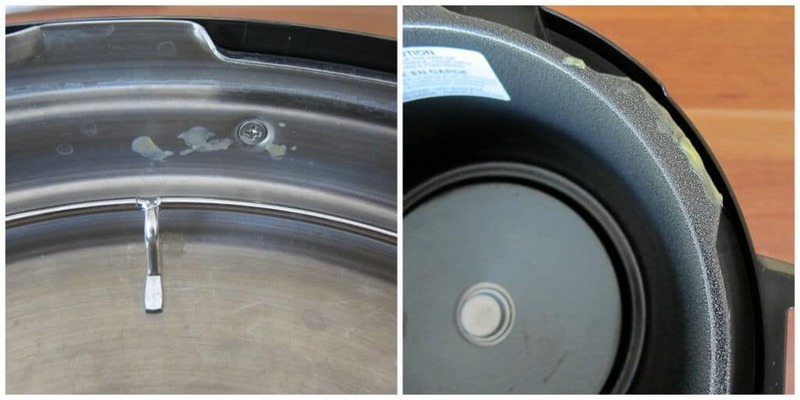 If your sealing ring is missing, you will see steam leaking from the sides of the lid. Solution: Replace the sealing ring. 4. Not enough liquid in Instant Pot. According to the Instant Pot manual, the Instant Pot requires at least 1 cup of liquid. I’ve used as little as 1/2 cup and done fine with many recipes. Some liquids like canned tomato sauce are too dense and require thinning out with broth or water. Solution: Add more water or broth. If the final result is a dish that’s too thin/liquidy, you can use the ‘Saute’ function and let the liquid reduce and thicken, or you can use a thickener like cornstarch, flour, potato flakes, etc. 5. Food is scorched on the bottom of the Instant Pot. If food is scorched on the bottom of the Instant Pot, the liquid won’t make contact with the bottom of the inner pot and the Instant Pot won’t build steam. Here are a few of the reasons food gets scorched on the bottom of the Instant Pot. After browning or sauteing, if there are browned bits sticking to the bottom of the pot, you need to deglaze the pot. Deglazing involves adding liquid (e.g. water, broth) to the heated pot and stirring, to allow the browned bits to come free. The liquid is too thick. This can happen with tomato sauce, thick sauces like mole sauce, or thick marinades. Thick sauces should be placed at the top AND you should thin them out with water or broth. The Instant Pot is overfilled with food and there isn’t enough room for the liquid to circulate. Once the inner pot is clean, resume cooking, but be sure to add more liquid. 6. Sealing ring has expanded too much and won’t seal properly. The sealing ring naturally expands when it’s heated. Once cool, it should return to its natural state. If you’ve just completed cooking something, the sealing ring may still be in its expanded state and your instant pot will not seal. Solution: Try placing the sealing ring in the freezer or run it under cold water to contract it. You can also try and turn the sealing ring over and replace it. 7. Sealing ring has debris/food. 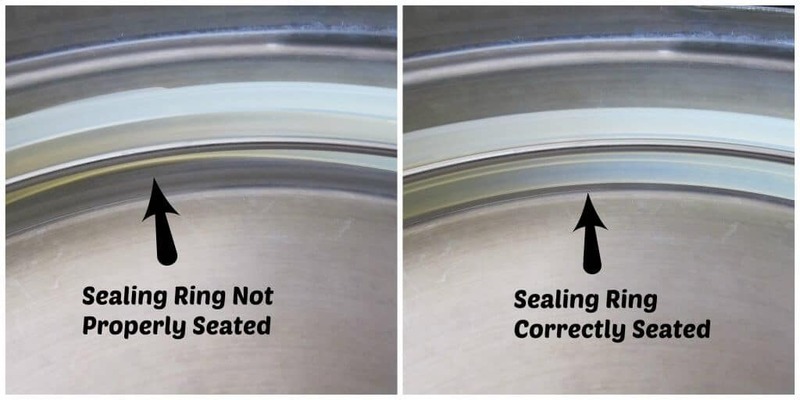 The Instant Pot sealing ring needs to be clean in order to create a proper seal. Solution: Make sure there’s no food stuck to the sealing ring. Clean the sealing ring with soap and water. 8. Too Much Water has Evaporated Before Problem Was Fixed. If the pot was not initially sealed and you corrected the problem, you may have allowed liquid to evaporate and so there isn’t enough liquid to create the required pressure. This can cause the Instant Pot to not pressurize. Solution: Open the Instant Pot, and check the quantity of liquid. You need 1/2 cup to 1 cup of liquid. Add more liquid if necessary. 9. Sealing ring is damaged or torn. 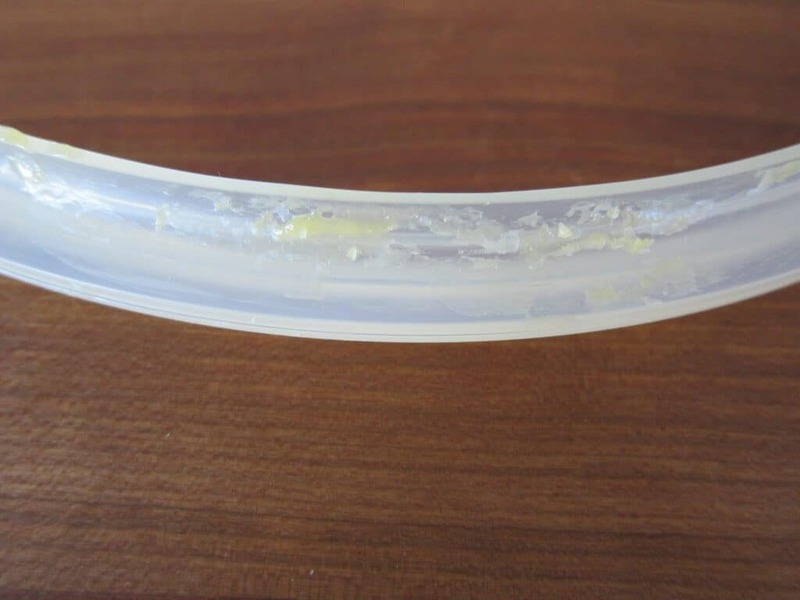 If your Instant Pot sealing ring is heavily used or pulled on too hard it can get worn out or tear. Solution: Purchase a new sealing ring. 10. ‘Timer’ function was used instead of ‘Manual’ (or ‘Pressure’) or one of the other cooking options. The ‘Timer’ button allows you to set a delayed time to start cooking. When you press the timer button, the time that shows up is the number of hours till cooking starts. Solution: Press ‘Cancel’ to cancel timer. Press ‘Manual’ or ‘Pressure’ (or other cooking option e.g. ‘Poultry’, ‘Meat’) and wait a few seconds for the Instant Pot display to change to ‘On’. If you wish to use the timer functionality, select the cooking function (e.g. ‘Manual’, ‘Pressure’, ‘Poultry’) first, then press ‘Timer’. 11. The Instant Pot lid area is dirty. The Instant Pot lid and the area it fits onto need to be clean and clear of food debris. Solution: Open the Instant Pot lid and use a cloth or clean toothbrush to wipe around the rim of the Instant Pot lid and the where the lid would sit. 12. The float valve or the anti block shield has debris. When you cook foods like pasta or other messy foods, the anti block shield and the float valve can get dirty and be obstructed. Solution: Remove anti block shield and float valve and clean with a clean toothbrush and soapy water. Clean the hole that the float valve goes into with a brush or pipe cleaner. Clean all parts of the lid. Dry well and replace the parts. See my Instant Pot Beginner’s Guide to find out how to remove these. Frozen food takes longer to cook and it also takes longer for the Instant Pot to pressurize. Solution: Wait a bit longer to see if the Instant Pot will seal. 14. Large quantity of liquid in Instant Pot. If you’re making a soup or cooking a larger quantity of food in the Instant Pot, you may have a lot of liquid. The more liquid you have, the longer it takes for the Instant Pot to seal. 15. Float valve is up but the display shows ‘On’ and countdown timer hasn’t begun. If the Instant Pot just says ‘On’, it’s because there can be a delay between the float valve rising up and the timer starting to countdown. Solution: Wait a bit to let the timer begin. The float valve coming up locks the lid but the Instant Pot may need more time to pressurize in order for the timer to begin. 16. Power Cord is loose. The power cord needs to be pushed in all the way. It can come loose if you move the Instant Pot or accidentally bump it. Solution: Push the power cord in all the way. I’ve gone through all the emails and comments I get and added these additional Reasons for Instant Pot Not Sealing. inner pot, the seal will not be tight when you close the Instant Pot lid and steam can escape. 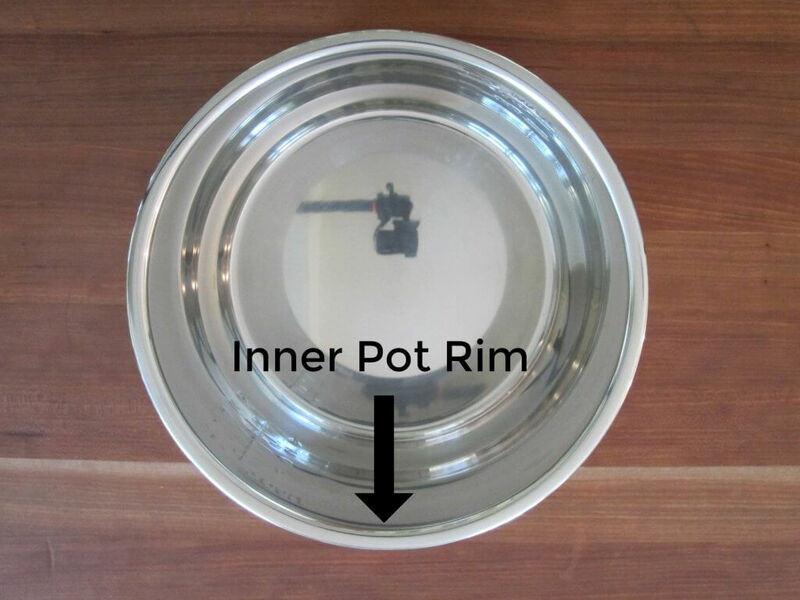 Instant Pot inner pot, particularly the rim, inside and out. If you have multiple Instant Pots of different sizes, you may have used the wrong stainless steel inner pot/liner. This is a common problem! Solution: Make sure you use the correct inner pot. 19. The float valve is missing. If you take the float valve out while cleaning the Instant Pot lid, you may forget to replace it. Solution: Put the float valve back in and replace the silicone cover. If you take the steam release handle out while cleaning the Instant Pot lid, you may forget to replace it. Solution: Put the steam release handle back on to the lid and push down to make sure it’s properly seated. 21. The lid locking pin is stuck. The spring-loaded pin (lid locking pin) on the rim at the back of the lid could be stuck in the retracted position. Solution: Push on it from the inside and outside of the lid or gently jiggle it to get the spring mechanism to reset the pin. 22. The exhaust valve is loose. 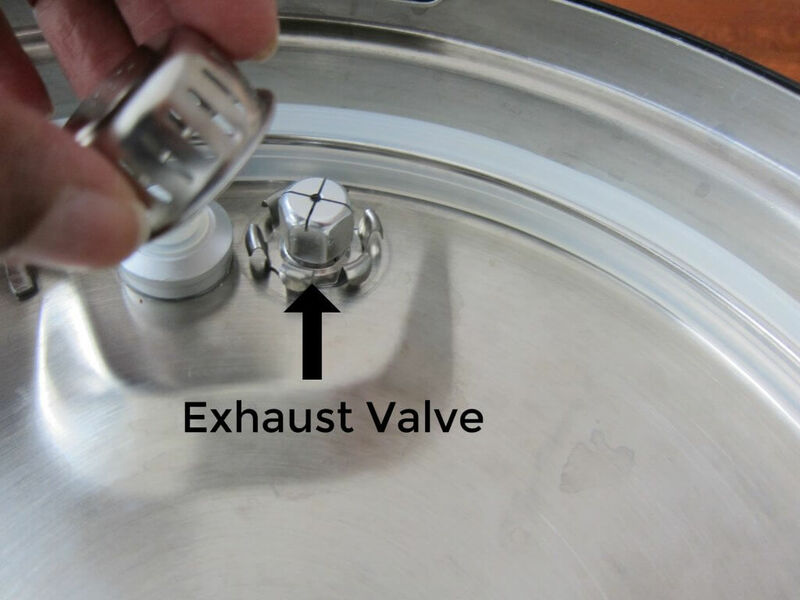 In rare cases, the exhaust valve inside the anti-block shield can become loose; e.g. this can happen during shipping. Solution: Carefully tighten the valve so it’s not loose anymore. Don’t overly tighten it. 23. The Steam Release Handle is not seated properly. If you take the steam release handle out while cleaning the Instant Pot lid, it may not be put back in correctly. It needs to be pushed in all the way. Solution: Push in the Steam Release Handle and move it from ‘Sealing’ to ‘Venting’ and back again a few times so it sits properly. I hope this troubleshooting guide has helped you find out why your Instant Pot is not sealing. Over time and with experience, you should encounter this problem less frequently. If your problem continues, try and do a water test. 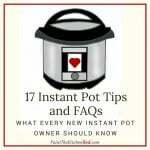 Also see my posts Instant Pot Burn Message, Instant Pot Quick Start Guide for Beginners and 17 Instant Pot Tips and FAQs. If you continue to have problems, you might have a defective unit and you’ll need to contact the Instant Pot company. Feel free to comment below if you have anything to add to this list that I may have missed! Coming from metal to metal seals…I overlooked a kinked seal. Thanks! That sealing ring can be tricky! You’re welcome. Khaty, you’re perfectly safe 🙂 There will be steam before it comes to pressure, but not while its cooking. That lack of steam allows the pressure to build. You can rest assured that the Instant Pot has lots of safety features, so don’t worry! If the pot does not pressurize should the countdown still start? Last night countdown started in manual mode but the pot did not come to pressure and dinner was ruined. Thanks! After having the same problem, I’m wondering this too. 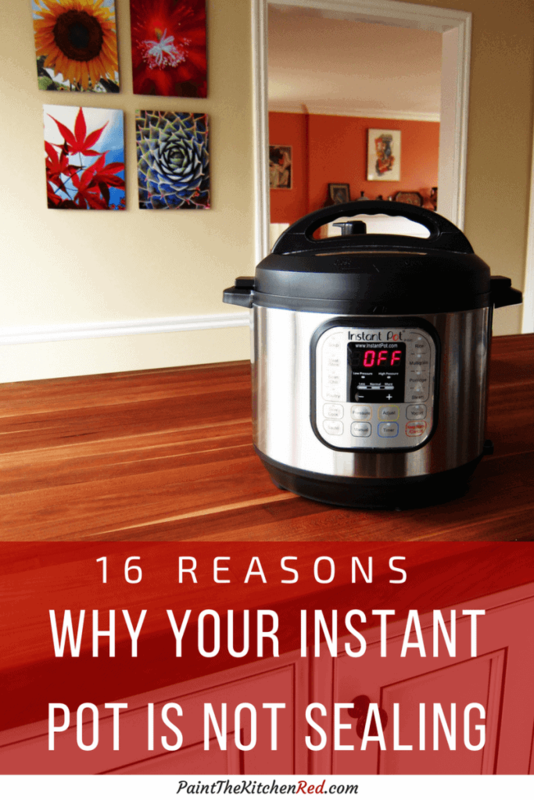 I love my Instant Pot and it’s usually foolproof – what a disappointment! Kit and Kitty, I’m usually really good about responding to comments, but I somehow missed Kit’s and only saw it when Kitty posted her comment – so sorry. So if your pot starts counting down and the pot does not come to pressure, it’s most likely that there was A) Not enough liquid B) Scorched food on the bottom before starting the pressure cooking C) Too much food in the Instant Pot and not enough circulation of the liquid. D) Pre-made sauce that has added flour/thickener E) Tomato based sauce that’s too thick. If you’re using a very thick tomato-based sauce, thin it out with broth or water and/or put water at the bottom of the pot, and add the tomato sauce as the final layer and don’t stir. Without knowing your recipe, it’s a bit difficult to diagnose what happened. Feel free to contact me if you have more questions. Good luck, and please don’t be discouraged. 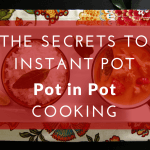 The more you cook with the Instant Pot, these incidents will occur less frequently! Happened again, two recipes in a row. I even replaced the sealing ring. The first night was chilli from pressurecookrecipes that I have successfully made before https://www.pressurecookrecipes.com/instant-pot-chili/. Three tries. I removed the sealing ring and on the third try it came to pressure. Last night I made Mongolian chicken from Sweet and Savory Meals https://sweetandsavorymeals.com/instant-pot-mongolian-chicken/. Three tries again, then I gave up and let the timer count down to zero while the IP hissed and clicked. I added a covered dish of rice on top during cooking but I frequently do this without issues. DH is ready to buy a new unit but it shouldn’t be acting up like this, I have only had the IP since March 2017. I love my IP and am not ready to say goodbye. Any help is appreciated! KIt, I’m sorry – how frustrating, especially when you’re trying to get food on the table… So a couple of things: is it possible this happens when you’ve already cooked something else i.e. has the sealing ring expanded? Also, have you taken out the float valve, anti-block shield and pressure release handle and cleaned with a brush or pipe cleaner (and the hole the pressure release valve sits in)? I have called the IP company and had them help me right away. Try and call them before you go out to buy a new IP. http://instantpot.com/contact-us/ Good luck, and let me know if you figure it out. Did your food burn on the bottom during sauté? I went through two units already. Extremely unreliable device. And I only used it a handful of times. Disappointed. Will be looking for a different one. I agree with you. Mine has been leaking everywhere, and I get the “NoPr” light. The InstantPot Duo 7-in-1 is a failure. I have the same exact model, which is a year older, and it works flawlessly, but this newer one, just will not work. I have read and done everything on this site, and I’ve contacted InstantPot customer service, and they only wanted to sell me another unit. Not happening. I see the raised metal ring on this pot is not uniform (I should say this pot has only been used SIX times since I bought it — got it for my mom — and she died, so it’s just sat in the box until recently. I am very disappointed in InstantPot, and VERY SORRY I had recommended it to so many people. I would have expected them to have sent me a new lid, but nope, they just told me the warranty had expired and to buy a new one. Whatever. My “old-fashioned” Presto pressure cooker that my parents bought me when I first married STILL works, so I am DONE with InstantPot. This happened to me on many frustrating nights. I’d start it over and over to no avail. Cleaned seals and everything. Then I tried something different. When it started counting down,when it should have gotten to full pressure, I simply pushed the lid down. This sealed the pot and the little valve finally popped up! Hopefully this simple fix will help you too. Thank you so much for sharing this information. This really worked! John, no don’t chuck it! So, the biggest advantage of the Instant Pot for me is that I can let it cook and go about doing other things without having to babysit. That being said, if your’s often doesn’t come to pressure, that advantage goes out the window – so I can imagine your frustration. I always advise people to use an existing Instant Pot recipe and tweak it to adapt to your own recipe. In this case, sounds like you had nuts in the sauce? Nuts are a problem in the IP for me – they tend to make the sauce stick to the bottom. I have not had luck adapting my chicken mole recipe without making major tweaks. Peanut butter thinned with liquid does work. Those types of dishes are best cooked pot in pot. There has to be liquid in the bottom of the pot in order to maintain pressure. Do you research on cooking with different foods. 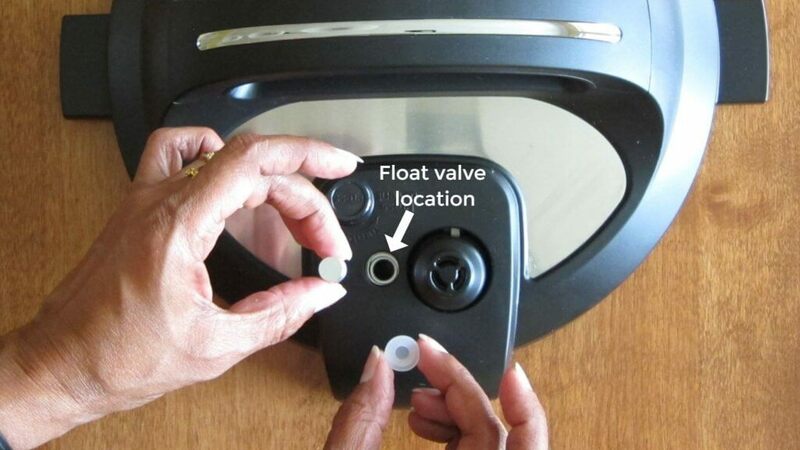 The float valve has a locking ring that prevents it from sealing when the lid is not fully secure. The safety mechanism is activated by a plunger that is pushed in. The plunger rides the inner heating pots locking cams, first it locks the float valve, then once tight, the plunger is free (out) which releases the lock on the plunger. The problem is ,if the inner heating pots is not perfect in place, when considering the outer plastic brim that has the steam outlet, the lid is in fact closed , but the plunger is pushed in enough to prevent the safety.mech from releasing the float.valve. it Is a defect, poor assembly out of the box . The fix is: hold the inner heating pot and turn it slightly inside the external housing. This allows the plunger to fully release, allowing the saftey mech to release the float valve once the lid is secure. Tj – thanks for sharing this information. I’m sure it will be useful to others who are experiencing this issue! You’re right John, that’s usually the #1 reason for me – usually because I’m trying out a new recipe and figuring out the quantity of liquid and/or optimum ingredients. I’m having the same disaster right now, that’s why I’m on the internet. I have been trying to steam a spaghetti squash for an hour now. I’ve trouble shot the suggested… the pot warms somewhat but it doesn’t get hot whatsoever. Nothing seems to work. Ehhh. So, I have two instant pots…. the inner bowls got mixed up. Whoops. Hi Codi, thanks for updating us. These things happen 🙂 Glad it was an easy fix. I’ve found that I need to push down on the lid sometimes before the pressure button will pop up and pressurize. Once I do that, the steam stops coming from the valve and it pressures right up. I think I may have worn mine out!! Hi Donna, this is a common issue that Instant Pot users encounter, and they do exactly what you’re doing. I’m not sure why it starts happening. You may want to replace the sealing ring and see if that helps…. Let us know if you find out anything else. Me, too! Same issue, but if I push down on the lid, it seals and all is well. So this is happening to mine too. EVERYTIME I try to use the pot, it does not pressurize. It takes 3,4,5 tries sometimes and I have found the last 3 pots of chilli have cooked to the bottom of the pot by the time it is done. Very annoying. I would rather use my crock pot and know it will be done when I get home than spend an hour and a half tryin to cook chilli. And yes, I have done very thing above including clean the valves. We are ready to chuck ours. How frustrating, Chantay. Have you tried contacting the company? I know some people push down on the lid right at the end when the sealing valve should be popping up, when steam is starting to come out. I don’t think this is recommended, but I know it works for them…. Thanks for the list. I couldn’t get the lid to close and after cleaning everything and replacing the ring, I was at a total loss when I scrolled down and saw your mention of a loose cord. 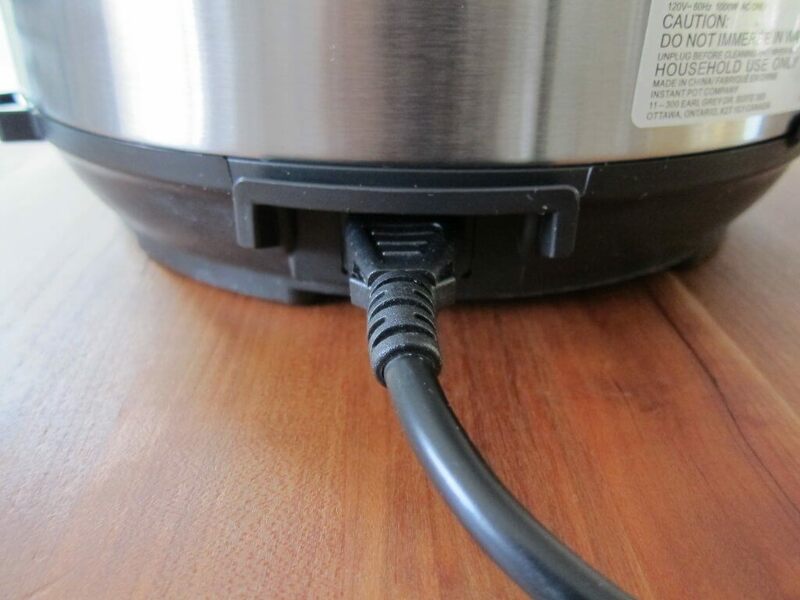 I shoved the cord towards its socket in the unit and voila, working Instant Pot! Chandra, in my opinion the best kind of problem! Easily solved and easily avoidable! Thanks for sharing. I’ll bet nobody has had an earwig crawl into the float valve cavity! Keep of spoiled my appetite. No idea how that happened, but it works a lot better now! Wow! Should I change the post title to 17 reasons and add your’s 🙂 ? That does sound unappetizing, hopefully you’ll get that image out of your mind pronto. Mine is brand new and I have to push the lid down to get the valve to stop sputtering, swishing and spewing steam. Hi Kathy, what happens if you don’t do that? Is it possible that you’re not giving it enough time to seal on its own? I have heard Instant Pot users saying they have to do this, but I don’t think with new IPs. If you take a video and send to the IP customer service providing the serial number they should be able to help you out. Good luck and thanks for your comment. Hi Amber – hope you got it worked out. Let me know if you have any questions and thank you for your comment. So I made a teriyaki chicken dish tonight and when I went to do a quick release I had sauce spitting g out of the pressure release valve. What could be causing this? Everything was cooked Just fine but I had a mess. I was able to just slowly release the steam to control the amount of liquid spitting out. But…. Hi Lauren – this can happen with some foods and sauces and also if your Instant Pot is too full. In this case, it’s best to let the pressure naturally drop a little bit and then release the pressure in spurts. I place a towel over the lid to control the mess. 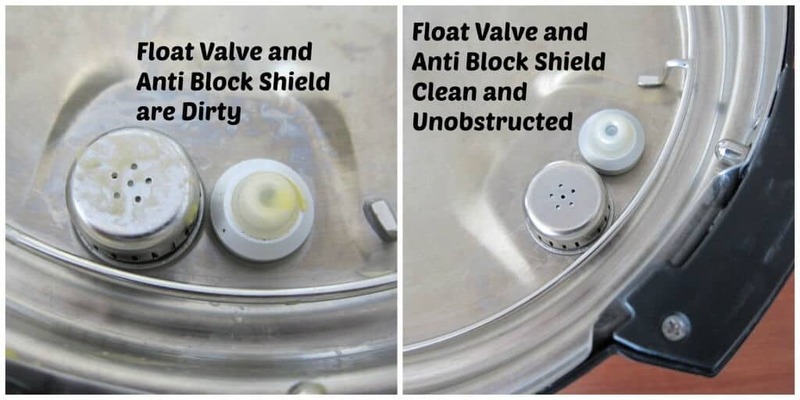 Also make sure you clean all parts including the sealing ring, anti-block shield and valves so that you don’t have problems the next time you cook something. 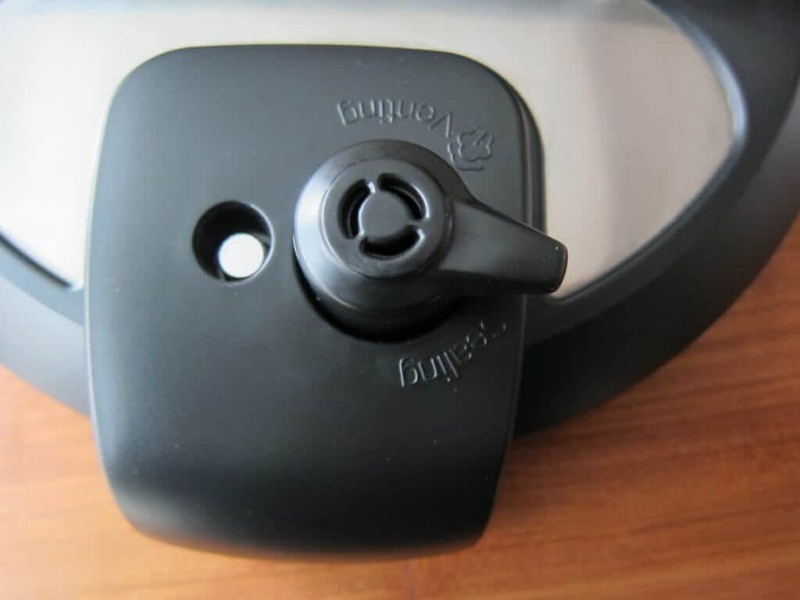 Hi Dj – The anti-block shield is on the inside of the Instant Pot lid, and is the metal circular part 1-inch in diameter with ridges on the side that is located next to the smaller silicone-capped float valve. On some older Instant Pot models, it’s more oval-shaped. Thanks for your question. I bought an Instant Pot 6 qt, read the instruction, did the suggested test run and there was no BEEP sound. I then tried Yogurt and again no BEEP sound. Has this happened to others? Is there a way to correct it? Do you have the Duo 6 quart? It could be that your sound has somehow been turned off. See if pressing and holding the ‘+’ button for a few seconds makes the beep sound turn back on. Do let me know how it goes. Yes I have the Duo 6 quart and I have tried the + button and after 3 seconds it shows “S On” but to no avail because there is still no BEEP to be heard. You might say that this Pot is defective. This is the third one that has been replaced and all three have no BEEP. Oh. That’s really odd. When you’ve been getting replacements, have you been in contact with the Instant Pot company? They’re pretty good at answering questions. I’m sorry for your frustration, but I’m stumped too. Good luck. We had a problem with ours not sealing after using it for several months, and thanks to this blog, we found out that it was #5 – scorching on the bottom of the pan from sautéing and not deglazing! Thank you for you blog post! Saved us more frustration! It’s amazing the reviews are so good when you buy this thing, and when you get one it has problems sealing!!! Ours is going to the dumpster!! Hi Dave – I’m so sorry you’re frustrated. I am not employed by the Instant Pot company (just a user) but somehow I feel responsible for making people like the Instant Pot! Can you tell me what you have been cooking when you experience this problem? Maybe I can try and help you out. My instant pot only comes to LOW pressure , so frustrating ! It is a relatively new pot ! Barbara – that’s strange. Please do contact the company. They’re really good about troubleshooting and even sending out replacement if there’s a defect. thank you so much, you give me hope ! Hi Barbara, you’re welcome. It gets easier, once you’ve cooked in the Instant Pot for a while and you make mistakes, you’ll know what to avoid! am a pro when it comes to pressure cooking . Love my Fargo stove top P.R. Is more reliable than the fancy Instant pot . ,for which I paid way too 1much and does only come to low pressure ! 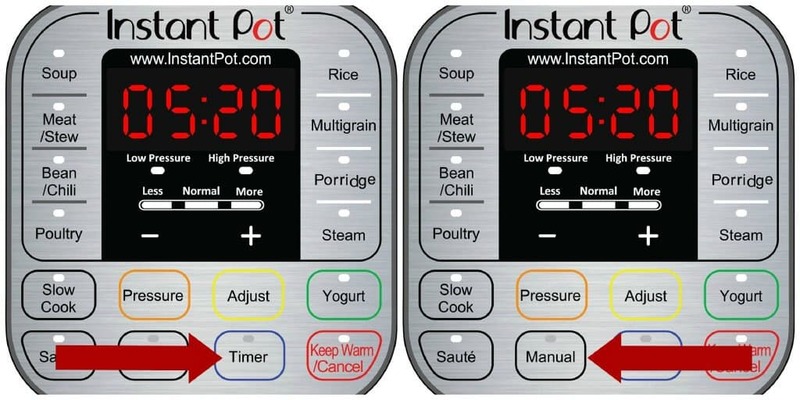 Barbara – if your Instant Pot is only coming to low pressure, there’s something wrong with it! You need to contact the company. Good luck. The first and second time I used my IP, I had no issues with pressure cooking. The 3rd time I had a heck of time with pressuring. Even in the sealed positioned, I had steam pouring from the valve as if it were in the vented position. It took 4 attempts to finally get a seal. The sealing ring was well seated and clean of debris, there was no debris on the lid, the float valve and antiblock shield were clean but I went ahead and cleaned all these things again. When I turn the knob from venting to sealing, it does not seem to lock in placere. I can easily twist the knob in a circle. Any recommendations for this. My IP is new so I shouldn’t have this issue, correct? Thank you for any ideas you can give me. Nancy – I’m assuming you have the LUX or DUO. The steam release handle should be loose, so that’s not a problem. But when you move it from sealing to venting it sort of lifts up a bit. It’s possible the steam release handle was not seated properly. Did you do a water test again? I always suggest a water test when you have these types of problems. It could be that particular recipe you were making, so if the water test works that’s probably the reason. Let me know if you can give me further details. Mine was doing the exact same thing. I spoke to instant pot and was told that it is not hard to tighten that valve. And that it could’ve loosened while being shipped. I read that covering the vent when doing a quick release with a kitchen towel helps keep splatter to a minimum. I have done this several times. I was just told that this practice is dangerous!! Can anyone tell me if it is true? And why it is dangerous? Hi Kathy – I too use a light towel lightly draped over the vent (but always leave an air gap) to prevent splatters and a mess. I think the reason they say it’s dangerous is because some people can do it irresponsibly: use a heavy towel, keep their hand on or near the towel, weigh down the towel, cover with something other than a towel. I think you have to be careful and cautious, like with any hot appliance. So the danger is burning yourself? Not the instant pot blowing it’s top?? That is what I was afraid of when I was told it was dangerous. I also think using common sense, and being careful is important, but being an IP newbie I am still learning the “how to’s”. Thanks for your reply. 🙂 And I love my instant pot. You can call me a “pothead” anytime 🙂 Love your site. Thanks Kathy! I think there’s controversy over this, and I am not an authority, for sure! Maybe the danger would occur if you have a very messy dish with lots of particles that could clog up the valve and then you cover the valve without anywhere for the air to escape. Like I said, I drape the towel, and always leave an air gap. I’m really glad you’re enjoying your new IP, come back soon! I just bought a new instant pot and had another reason why it would not pressurized. I guess during shipping, the valve was loosened and although it was in the sealing position it was not sealing. To fix this, you have to manually fix/tighten the valve so it is working correctly. Abby – thank you so much for sharing that. I’m sure it will help others. Glad you were able to get it figured out. How do you manually fix/tighten the valve? I have been using my pressure cooker almost every day for months — but yesterday, after it reached pressure, steam started coming out of the sealed valve. I tried to re-seal it, but in the sealed position, steam was escaping, and it was slowly moving on its own to the venting position. Somehow, it stopped releasing steam when i moved it a little bit from completely sealed to venting. Makes zero sense. I cleaned it thoroughly – and it continues to not want to stay in the sealed position about 2 minutes after it reaches pressure & starts counting down. This may sound like I did not read the manual and you would be right. Just got my IP and no idea where the manual is. My question, you folks talk about sealing, but I am having a hard getting it to just seat. Should you not beable to twist the lid on to line up the lid indents with the base indents. For the life of me I cannot make that happen. Or is that not a thing is it just the rubber seal that locks the lid into place. I have used a few times and everytime i can simply lift the lid without depressuring it, (which means it never did pressurize). I bought an InstaPot about a year ago, but could not get it to work properly for me after multiple attempts. I took it back to the store for a refund. The company’s phone support was of no help at all. My 40-year love of my crock pot was reaffirmed. I could count fewer than 5 meals that ever went south in it. It is easy to see why there is the frustration that there is with the InstaPot: There are many variables to consider by the user who puts the IP to work even several times weekly. Too much water, too little water, liquid too thick, volume of the food too great in the IP, the chemistry of the cornstarch possibly complicating the process, or perhaps the lid fails to seal because the pot itself has become bent out of shape and is no longer truly round at its opening. Using an IP is an endeavor that I am willing to undertake again this Christmas. The value of its speed of cooking and ease of operation can’t be overlooked. I need to adjust my expectations, become a student of the appliance’s related methodology, and give it another go. Hi Greg, I am glad that you’re rethinking your decision and are planning to give it another try. You’re right in that the pressure cooker is not as simple as the crock pot and there’s definitely a learning curve. I think almost every new user has a few failures that they learn from. I had a few fails when I first started using mine too! Do check back in to let us know how it went for you. And feel free to ask any questions. Lately, my IP has been giving issues after the countdown. it seals and then after the countdown starts it starts releasing steam. so my rice ends up dry. now I’ve been doing 1 cup of rice and 1 cup of water. is it too little? its a 6 quart IP. For long grain, basmati rice I too use 1:1. So I don’t think that should be the problem, but maybe you can try and add an extra 1/4 cup. I’ve heard of people moving the pressure release valve to vent and then back to seal. Can you try that? I made beef barley soup today. At end of cooking time, I hit “cancel” and also turned the release to “venting”. No steam at all came out. Is this right? Hey there, Deborah. Did you do a NPR (Natural Pressure Release)? If so, then there would be no steam. If you did a quick release, then there would be steam coming out especially with a soup. If there wasn’t, your Instant Pot may not have reached pressure. Was the soup cooked well? I used my IP for the first time on Sunday with no issues. I tried again last night, and had some minor problems. After that I decided to open – the food was cooked and turned out just fine. I just can’t seem to figure out why the countdown never comes on. Any ideas? Christina, the fact that the float valve was up means it did seal and although it can take some time to go from ‘On’ to the countdown, it shouldn’t go straight to Keep warm. I feel your unit is defective. Try the water test and see how it goes and then I would contact the company to troubleshoot, or I would return it. My IP seems to have a defective relief valve. The silicone tip inside is not uniform. Just got a new instant pot and I’m very frustrated. I can’t get anything to work–the sealing ring is in place, not damaged, the support ring looks even all around and not bent, the pop-up valve moves freely and looks right, the anti-block cover is properly installed over the venting valve. I’ve washed everything thoroughly, and water flows through both valves in the lid. Yet when I seat the lid, when I push ANY button except for the “keep warm” button, I get “lid” flashing in the display and the unit beeps repeatedly. This happens on every cooking setting–even saute, when the lid isn’t even on. Can’t even slow cook. Any ideas? The Lid warning comes on when you don’t have the lid on for normal cooking, or when you have the lid on for sauteing. Even with the error, are you able to begin pressure cooking? It sounds like you’ve done everything you can do. But before contacting the company and opening a support ticket, I would try to do a factory reset. It depends on the model but it could be holding down the Adjust button for 3 seconds or the Cancel button. Your manual will tell you how to reset, or you can let me know your model. Please keep my posted and thank you for commenting. Yes, on my unit the factory reset is holding the “cancel ” button for 3 seconds till it beeps, which I’ve done a few times with no change. I can’t do any cooking, on any setting, the “lid” warning apparently blocks all further attempts to cook. The error must be in the electrical portion of the unit and not the lid, since I get the “lid” warning when the lid isn’t even on and I press sauté. I’ve opened a factory ticket, we’ll see what happens. I brought this from the US to my home in the Caribbean, so I can’t just return it. Hoping they can help me. After I posted that last sentence made me start wondering. I brought this unit to my home unopened, in its original packaging, in checked baggage on a typical passenger airline flight. Don’t know where these are made, if they are always ground shipped, but is it possible that flying in the lower-pressure environment of the aircraft cargo hold somehow affected the lid sensor electronics? Karen – We have the same problem. First time out of the box, we get the lid error no matter what.. Did you figure it out? – Is it on Saute when you’re trying to close the lid? – Do you have another Instant Pot and is it possible you switched lids? – Did you try and unplug for a few minutes and let it cool down completely and try again? – Try and do a factory reset by pressing the Adjust or Cancel key (depending on your model). 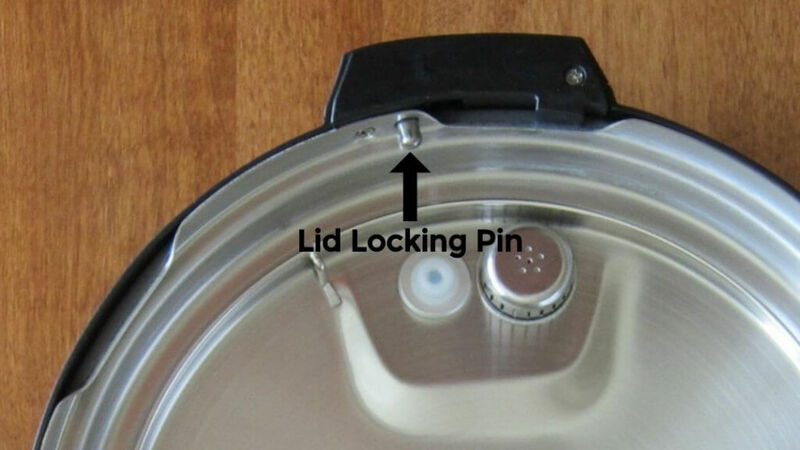 – Is the metal safety lid lock pin stuck (it’s a spring mechanism on the side of the lid)? It might be a defective lid in which case you can either return it or open a ticket on the Instant Pot website. https://support.instantpot.com/ Good luck. Hi, I helped my daughter with her 6 qt IP, we made Mac and cheese, steam was escaping around lid, value did not pop up, no steam when did a QR. it was cooked but burned on the bottom? We then made chicken noodle soup, same thing with steam escaping around lid, took 35 minuets to pressure, chicken was done but no steam when we did a QR. Hi Bonnie – if the valve doesn’t pop up, your pot isn’t sealed. So in the first case, it sounds like you didn’t have enough water or your sealing ring had issues. In the second case, you mention that it took 35 minutes to come to pressure. Depending on the quantity of liquid, the Instant Pot CAN take that long to come to pressure (esp if it’s filled with liquid, like in a soup, or if the ingredients were frozen or very cold.) Was the soup cooked properly and was the quantity of liquid intact? Did you see the countdown (i.e display changed from ‘On’ to the number of minutes you programmed it for)? If you did see the countdown, and you did a QR immediately upon cooking being completed, there would have been a lot of steam coming out since it was a soup. I would suggest you do a water test first to make sure your Instant Pot is working properly. https://www.paintthekitchenred.com/instant-pot-how-to-quick-start-guide/ Good luck and let me know if you have further questions. I just saw this on a Reddit Instapot site and it worked for me. I think you need to wash it. Don’t be afraid of submerging it. Remove the ring, then everything else can take soap and water. I am guessing that its dirty. Perfect, thanks for sharing. Yes, a very basic piece of advice but so helpful. I put my cover in the dishwasher – remove the sealing ring and put it in the dishwasher too. Since I got my 3 qt Duo, i have have had nothing but problems. Only one meal cooked perfectly well with a small hardly visible mist escaping. Other than that, multiple attempts to cook rice and also beans have been undercooked, stuck to the bottom, and worst is the sputtering of water from the pot . My counters get drenched, I have had a problem finding a place in the kitchen where the steam does not drench the lights or cabinets above the IP. Even food comes out, with white water from rice and a real mess with oatmeal with milk. I have followed all directions multiple times. I have extended the cooking times by 5-10 minutes with no improvement. I think that so much liquid escapes that the food is cooking dry. The initial and subsequent water tests resulted in all the water evaporating and the bottom of the pot white with water residue. Nine days of waiting to hear from Instant Pot support, I tried email, online support and chat. Direct phone call was 15 minutes on hold until I hung up . Judith, I think the company is swamped due to the holidays and the volume of purchases. I’m sorry to hear you’re having trouble. Do keep me posted on your situation. my comment is awaiting moderation. What does that mean? Am I to do something else here? Hi Judith – The comment should be visible. Can you see it now? I sent you an email at the email address you provided, to follow up regarding your problem. Let me know if you didn’t get it. Any advice for a Duo that leaks steam (a lot) from the front and back of the lid (not through any valve)? Only the 5th time I’ve used it, so it’s immaculate. Just trying to accomplish the IP water test per the FAQ. Follow up to my Duo question: the spring loaded pin at the back of the lid, on the outside, was stuck in the retracted position. Pried it loose, it snapped back into place and the IP is back in business. Excellent – I’m really glad it worked for you and also I’m so grateful that you followed up, because your comment will most likely help someone else! Thank you so much for the article. I have Duo 6 qt for the past year and it was working great till yesterday.The float valve is stuck and I am unable to take it out to clean it even. Followed the getting started on IP site. It seems like there is something metal on either side of the valve that is preventing it from popping all the way up and even coming out for me to clean.. any help is greatly appreciated . I use my IP everyday to cook and lost without it ? Hi Shuba, The float valve comes out by removing the silicone cover. Have you tried to remove the silicone cover as shown in the Quick Start Guide post I have? I’m not really sure what you’re describing. You could send me a photo by emailing me at paintthekitchenred gmail.com. I’d love to help you out. You mention when you first turn on the instant pot”you’ll see and hear steam coming out of the pressure release (steam release) handle and/or float valve.” Can you tell me why it does this? Why does it release steam when it is trying to pressurize? The problem that I am having is that I set the instant pot and during the pressurizing I see exactly what you are describing above. It does not stop on its own (at least I havent let it), and I have to give the lid an extra tightening. It then stops and seals the pin drops seconds later. – Have you tried a simple water test, with just 1 cup of water and do you have the same problem? – Is it possible your sealing ring needs to be replaced? Have you tried putting it in the freezer? Or turning it over? – Are you cooking items with a lot of liquid? In that case, it will take a long time to come to pressure. How long are you waiting before you push down on the lid? – Have you made sure to clean it thoroughly? So… somehow my float valve got turned around in the hole and I didn’t notice… so it was not sealing of course. This happened when I cleaned the lid in the sink. Unplugged. Wait for vent and cool down. Turned the float valve around and started again. That worked. Hi Dave, wow – that’s a new one. Thank you so much for posting that because if it happened to you, it will probably happen to someone else and this will help them. Glad you figured it out, and thank you for commenting. Never had a problem with my Instant Pot before, so tonight I was surprised when it pressurized but wouldn’t count down. After an interminably long wait, I vented it and depressurized and checked things out. The contents were roiling and boiling. I tried the chili inside and decided it needed to cook a bit more. So I added some liquid and tried again. Same thing. So I tried a third time. Still no countdown. What’s up with that? Hi Alex – You probably already know this but if it had a lot of liquid in it, it can take a while (I’ve heard of 20 min!) for the countdown to begin, especially from cold start. Make sure the ring is clean and your lid too, in and out. Also all the little nooks and crannies. Turn your sealing ring over – sometimes that works. Or try and put your sealing ring in the freezer. Another thing that works for some people is, once they know it’s sealed and the float valve is up, try and gently push down on the lid – in that case it’s probably the sealing ring is just not sitting right… Let me know if you have any updates! Hi Stephanie, Some Instant Pots e.g. the Lux have a float valve that looks different – like there’s a hole. 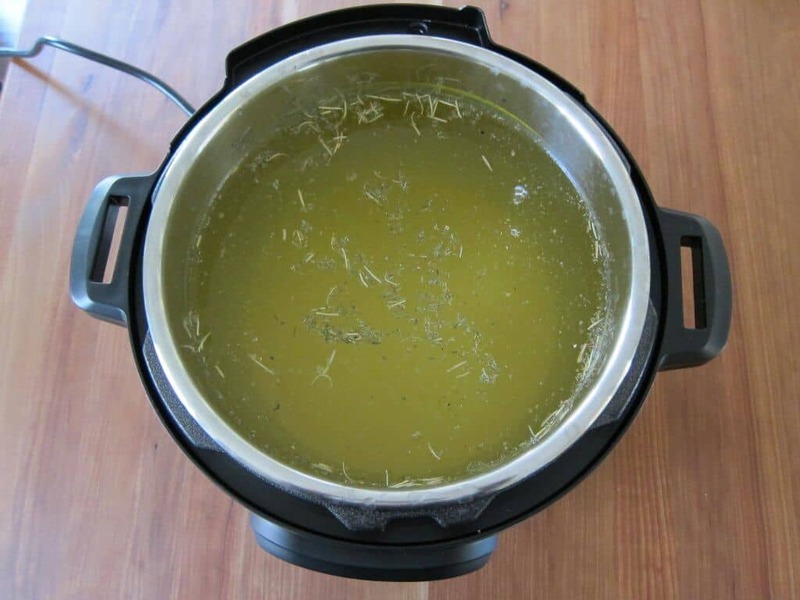 This post from Hip Pressure Cooking has images – is that what your’s looks like? In which case, you’re okay. The not building up pressure may be related to something else like those I mention in the article. I hope that helps. What a nice blog, thank you so much for contributing this helpful information! Thank you, Diane, for your lovely comment! That Timer button is what was killing me! Thank you for explaining! I love this! Hi Karan – believe it or not, you’re not the first to do that and probably won’t be the last! I came down here to the comments to add the same thing! I love having a 6 and an 8 IP, because I like to make rice in the smaller one. Apparently the small inner pot got put into the large pot accidentally, causing a night of absolute frustration when making some venison stew. I tried everything on your list and every other list I could find, and never solved the mystery until I was putting the stew in containers. If I could plead with you, might you put in a tiny edit for folks to check this if they have two pots? Thanks for this list. My pot has been failing to seal recently. I will go through your list as a checklist the next time. Very handy. I use it every day, especially when traveling with the RV. Hi Ruth – I hope you find our what’s happening with your IP. It could be it needs to be cleaned thoroughly or the sealing ring needs to be replaced. -for example, I make a sauce and want to cook pasta in it. I know it is heating because the food is burnt to the bottom. I have tried putting the top in the freezer thinking the metal had expanded and with new gasket still no re-pressurizing. I am in Boston, so in total frustration, tonight I put the whole pot outside, – ajar, freezing temps ( 30 min) and then changer the gasket still no pressure. I really want to be able to use my Instant Pot 2x in a night in the pressure mode. I have 2 IP, one old Lux 6in 1, and one new Ultra 10 in 1. Had no problems with Lux, but the Ultra ‘s first water test failed as steam was coming out of that safety shield. The floating valve was up, but no counting down. I tried 3 times, the same result. I was so frustrated. I inspected the lid, no problem, I just played a little with the upper part of the shield. Tried again, it worked. It work without any issue until today. Actually it first happened a few days ago, when I did some soup. I boiled the meat before and it worked, but after adding some vegetables (next day) it failed to seal like in the fist water test. The floating valve was up, but steam was coming from the blocking shield on and on, and no counting down. I tried to move that shield to no result. I suspected it was too much liquid. I moved the inner pot in the LUX it worked!. Today I used the pressure menu to boil some meat in 2 l water. The same problem. I ended up using the old LUX. I removed the shield to clean it, although it looked clean. It was clean but still used some detergent and a lot of water to clean it. I did the water test. It worked. I wonder why it happens. I have never ever opened that shied in the LUX lid. It always worked. I love my new Ultra as it has options the Lux lacks. but There is something wrong with the lid, though that shield looks the same with the LUX. I don’t know what’s wrong. Hi Sabrina, when you say ‘safety shield’, I think you’re referring to the steam release valve (the wobbly round part) on the outside of the lid right? Sounds like your steam release valve is defective, maybe. Try also cleaning the hole that the valve is covering too. Sorry for your troubles – I hope you’re able to contact the company to try and get the lid replaced. I had an issue with steam coming from the sides, not the vent, even though the lid closed. I use my IP a few times a week for 2 years and never had I seen that before. I hit cancel, removed the inner pot with these handy clamps I got for the task, checked everything out and it turned out that I had a remnant piece of food on the rim of the inner pot from when I sauteed first before transferring to a pot within a pot (quiche), That was enough to prevent proper sealing. Just another thing to check. Hi Joshua – so interesting! Thank you so much for sharing that. I’m sure you’ll be helping out someone who has the same issue in the future. My grandma, may she rest in peace, taught my mom to put some oil inside the lid then put the sealing ring in. I blot any excess oil with a paper towel and it seals right up. Hi Madli, I’ve never heard of that before. Thank you for sharing. I’m pretty sure your grandmother was talking about a stove pressure cooker and not an electrical one. If all else fails I suppose it’s worth a try but I don’t know how safe that is. Just an FYI for others. My steam release handle seems very loose recently. During a water test steam was escaping with the countdown going on. I had to keep moving it and adjusting it till it finally stopped leaking. Yesterday’s beef stew got burnt because all the water had steamed out, I was shocked because it was in the sealed position but not actually sealed. Can a replacement be bought? Or how to tell if it’s faulty? Sarah – the steam release handle should be pretty wobbly to begin with. Is it more than usual? I wonder if it’s time to replace your sealing ring? I feel mine is ready to be replaced! This is exactly the problem I have. My sealing ring is brand new. I got this last year for Christmas but haven’t pulled it out to use until about a month ago. I’ve made about 4 or 5 dishes and each and every time, it releases steam throughout the process, even when it says it’s pressurized. I really am getting annoyed and angry that we wasted the money on this thing. Everything is always scorched on the bottom no matter how much liquid I put into it. I seriously needed this to work for us. We are living the RV life and this gas stove won’t bring a pot of water to boil, but that’s another story. I do not feel that I should have to buy another ring when this one is still new and in very good shape. Oh and it’s not just the 8 quarts having problems because mine is a 6 quart. I do not overfill it, etc. I didn’t make something clear, my husband bought this for me for Christmas, hence the gift and wasting money. I love my IP and I love your helpful information. I’ve only had it for a month but I’ve used it a lot without any problems – until tonight. It wouldn’t pressurize so after reading your blog I did the water test and that worked fine. I’m hoping that it’s fine now but I’m going to make sure it’s all clean and not scorched and that there is enough liquid! Fingers crossed! Thanks again for all your useful information. Thanks for letting me know, Diane – I’m always happy to be of help. It probably was a one-time thing, maybe something stuck in the nooks and crannies or food stuck on the bottom. 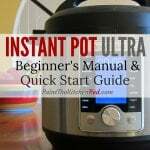 New instant pot ultra here, and it never worked. I’m getting the infamous “burn” message with everything and it leaks steam continuously, even with the test run with water only. This problem seems common, browsing amazon reviews. Their customer support takes days to respond with some of the common advice I see here, which is a little silly for a product fresh out of the box. I might have to try appealing to Amazon for a return, because the customer service is awful. After sending photos of the outside, product tag, inside of the lid, the serial number (ironically next to a “QC pass” sticker), and video evidence of the steam leaking, they still take forever. A broken new product and horrible customer service completely kills this brand for me. Those considering jumping on the IP bandwagon should consider this before buying. With a product so prone to failure and requiring such debugging, you’re also saddled with this level of customer support. And I think the fad may subside once people’s products start nearing that warranty date. Hi Dave – I’m sorry to hear that you’ve had such a bad experience. My experience has been the opposite because I own two products and any sealing issues have been user-generated. I hope that the problems you’re describing get solved with the next generation of Instant Pots. No worries. Worse things in the world. It’s hard for me to overlook the odd customer service, but perhaps the issue is specific to this ultra line. Customer service has concluded the cause was a faulty pressure sensor at the base of the unit. I’m guessing there’s no fixing this, because they quickly began shipment of a new unit, before I could reiterate that I originally asked for a refund! I’m just glad some manner of resolution has been made, though I’m afraid to unbox the next one and discover a similar issue. Nonetheless, this might help you troubleshoot some of the newer units. Yes, you’re right – other readers will benefit from you having shared your experience – thank you! And glad to hear that you’re getting a replacement. No sense waiting, just get it out and test it right away! Dave thanks for sharing your experience. I just bought an Instant Pot during a BF sale and I’m going to be rigorously testing it tomorrow and making sure there are no problems with it before the return period expires. My mother cooked with an old fashioned pressure cooker and buying an instant pot seemed like a no brainer. However, I really don’t want to spend more time troubleshooting than necessary or ruining meals because it’s unreliable. I want cooking to be simple not a hassle and these issues make it seem like a hassle. The bandwagon may just be that. Let’s see how well my new 10in1 6qt instant pot works and if it’s worth the still hefty price tag. Hi Mandy, I think it’s a great idea to test it out. Many people buy the IP and don’t open it for months and then have no recourse. That being said, the problems that occur are usually avoidable if you follow certain guidelines: use enough liquid, layer tricky ingredients, deglaze well, etc. For your first few recipes, avoid tomato-based sauces and make recipes that have plenty of great reviews. A soup would be a great choice. Just to get familiar with the appliance. btw, the model you purchased is a great one – I love it! All the best! Thanks for this list of things to check! I was beginning to become concerned that it was taking so long for my IP to pressurize. It just needed more time, thankfully. The food I put in there wasn’t overly hot, so it had to get up to temp first. This was a great way to pass the time and as I was finishing, the timer started! I’m glad you figured it out; thanks for commenting! Thank you for writing this. Turns out, I justneeded to clean the bottom of the pot after searing! Hi Catherine, very common issue; especially for new users – glad you got it figured out!